Was Wright responsible for designing Mill Wood and its buildings? In this regard the comparison with Wright’s documented work at Stoke Park in Bristol is enlightening, the similarities are so close as to make a full attribution to Wright’s guiding hand at Halswell’s gardens tantalisingly close, as many people now believe. The individual buildings here by Wright, and their interrelationship within a sculpted landscape, bear close comparison to those at Halswell, though many have been lost at both sites. 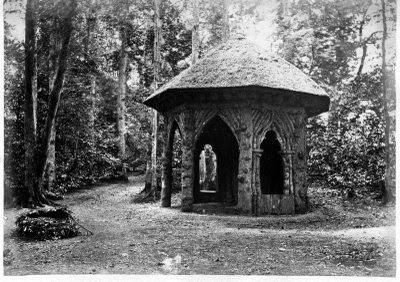 The Rotundas at both estates were nearly identical; Bladud’s Cell, a ‘root house’ similar to Halswell’s Druid’s Hut; Stoke’s Beaufort Memorial shared a similar ethos to Halswell’s Horse Monument, etc. Wright’s work for Norborne Berkeley, 4th Baron Botetourt (1717-1770) at Stoke Park is well enough documented that there is no question of his involvement in that estate. However documentary evidence of his work at Halswell has not been found and therefore establishing connections between Wright and Halswell in other ways must be sought. Beyond the similarities within the landscape what evidence is there that Thomas Wright of Durham and Sir Charles Kemeys-Tynte even knew each other? Well, one of the more unusual connections between Sir Charles and Wright is the little known Irish portrait painter Thomas Frye. The number of works by Frye is slight, yet he made an engraving of Wright in 1737 and painted Sir Charles in 1739. All three men had Irish connections, Frye being Irish, Sir Charles had distant family in Ireland (Sir James Tynte) and Wright famously spent a year touring Ireland and recording its ancient monuments for his book Louthiana: an Introduction to the Antiquities of Ireland. But Wright’s Irish trip was not until 1746-7, so the choice of the artist for both men may have something to do with another shared interest that brought these three men together, such as Freemasonry. It is likely all three men were freemasons but proof at this early stage of that organisation is hard to come by for some members. Wright is recorded but not confirmed, the later Kemeys-Tyntes were very important freemasons but Sir Charles’s was only initiated into the Bear Inn Lodge, Bath on 28th December 1767, over a decade later than Wright’s likely involvement with the landscape works at Halswell. Frye painted other prominent figures in the organisation, such as John Theophilus Desaguliers. These links may prove fruitful with further research but it is to the buildings themselves that we should turn. The builder Jacob de Wilstar was the cartographer for Halswell in 1756, as well as many other estates in the Bristol area, and this record of his building work, at such a time of building expansion at Halswell, may make his involvement in many of the other structures likely. 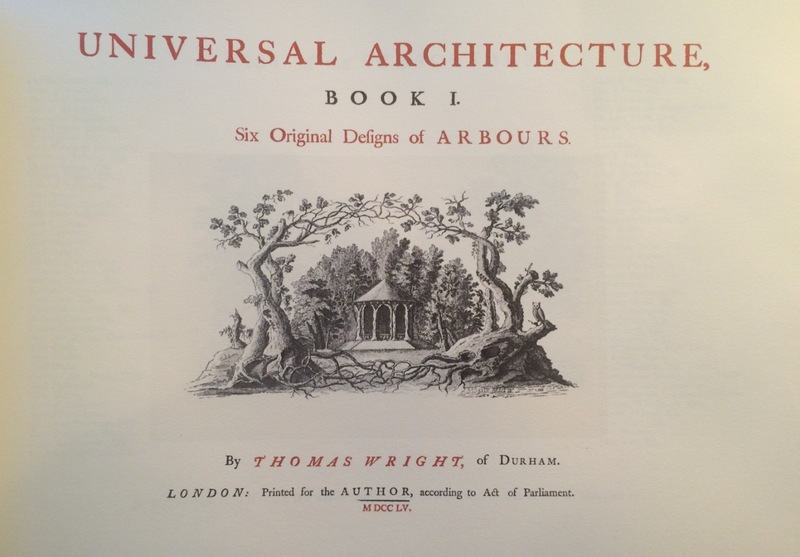 Thomas Wright’s Universal Architecture, Book 1: Six Original Designs of Arbours was published in 1755 and the similarity to Wright’s design is clear: a hexagonal, thatched hermitage-like folly with a cobblestone floor and constructed throughout using timbers that were or were carved to resemble rustic, found, tree parts. The three sections at the rear contained niches, the two flanking sections windows, and the three to the fore were open to the ground. All of these specifications were included in Halswell’s Druid’s Hut. The niches on the rear three panels were decorated with paintings, according to an eye witness source, Mrs. Gill Durman. One was of Stonehenge, while another was a portrait. The same source has confirmed that the cobblestone floor was laid out in coloured stones with the shape of a star filling the centre. Sir Charles’s execution of Wright’s published design does not mean Wright had any hand in it or even any knowledge of Sir Charles’s use of his design. His publication was intended to be used in just this way, as a sort of pattern book, as furniture and other designers were producing throughout the eighteenth century for the same purposes of disseminating their work and giving style guidance to a public thirsty for the best of the latest fashions. 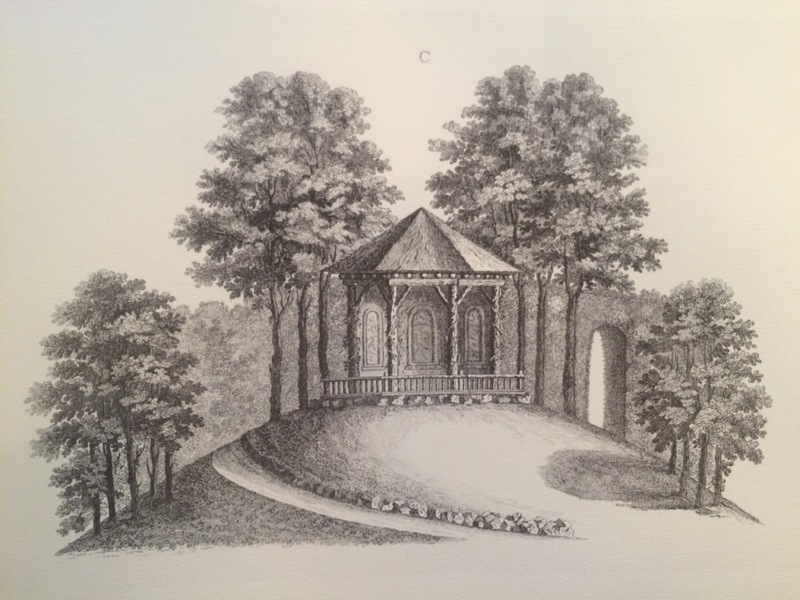 However by the time Wright had produced his next book in the series, the 1758 Universal Architecture, Book 2: Six Original Designs of Grottos Sir Charles had become a subscriber, or a patron contributing funds for its publication. So we know that by that date at the latest Sir Charles and Wright were in direct contact and with some form of financial relationship. One very likely connection between Sir Charles and Wright was their mutual friend the Duke of Beaufort. Sir Charles was a political allay of the Duke since at least 1745 and Wright had been working for him at Badminton House by 1750. 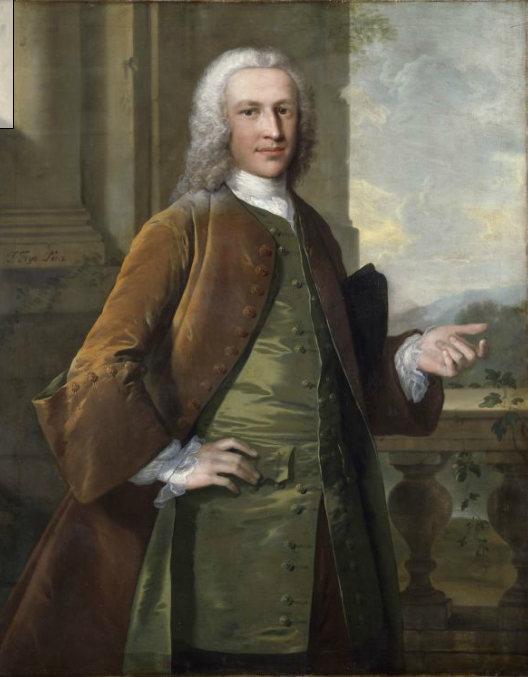 Wright’s connection was through the Duchess who was the sister of his patron Lord Botetourt at Stoke Park, where he worked from 1748-1766. The Kemeys are strongly linked to the Beauforts throughout eighteenth-century politics and particularly the seats of Glamorgan and Monmouth. The fight for Glamorgan is interesting, it had been held by Charles Kemeys (1678-1734) for the Tories but then went to the Whigs after his death. 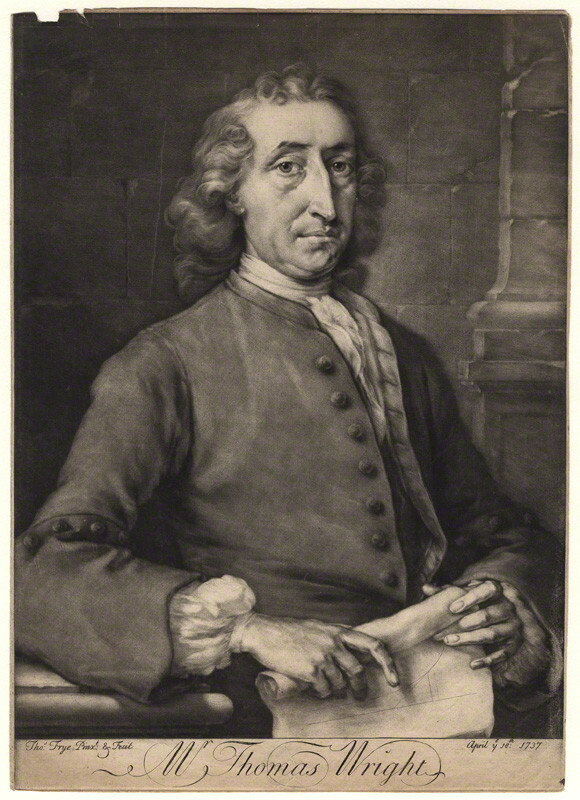 Sir Charles Kemeys-Tynte was put forward 2 January 1745 by the Duke of Beaufort in an attempt to win back the seat for the Tories, but was narrowly defeated, 688 to 641. On 14 March 1745 Sir Charles sat for Monmouth, taking the seat over from the 4th Duke of Beaufort unopposed until 1 July 1747 whereafter he sat for Somerset with Thomas Prowse (both unopposed) and the seat at Monmouth was taken by Fulke Greville, kinsman to the 4th Duke of Beaufort. 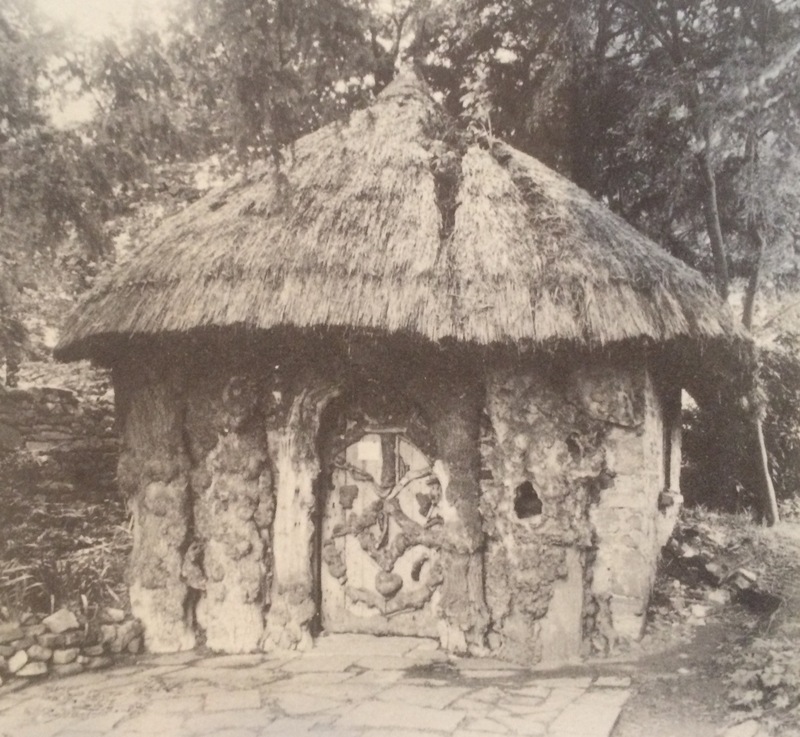 Another hut influenced by Wright is Dr. Jenner’s Hut (or the Temple of Vaccinia as Dr Jenner administered the first smallpox vaccination in this folly in 1796) near Berkeley Castle, where Wright worked extensively for Norborne Berkeley, Lord Botetourt as well as his sister the Duchess of Beaufort at Badminton House. 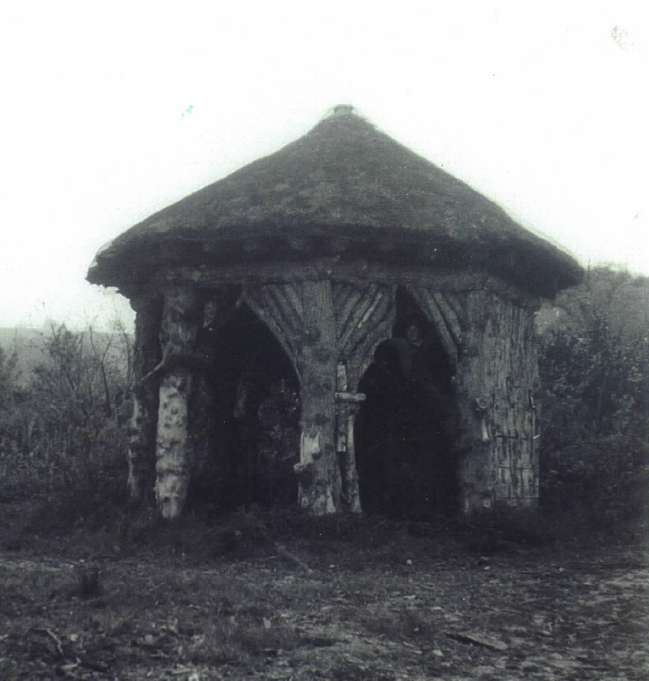 The Druid’s Hut, 200 years after it was built, photographed in the 1960’s with two children playing impishly in the arches – photograph courtesy of Mrs Gill Durman. The Druid’s Hut disappeared in the late 1960’s. In a personal admission delivered to the author while attending a wedding at Huntstile Farm in 2015, this happened when a fire took hold after two boys left burning embers inside while playing in the hut. They found out the result of their shenanigans the next day when one asked his mother why there was a fire engine nearby and was told the hut had caught fire – the admission of guilt took 50 years! A near inevitable end for a building that had miraculously survived the destruction of the parkland trees and other monuments after the estate was broken up in 1950. Even more miraculous is that a building of rustic timbers and thatch had survived for over 200 years. But with the structure above ground gone there was little reason not to plough up the cobblestone base and farm the land on which it sat. Once that was gone there was no trace of Wright’s building, until Edward Strachan invited archaeologist Mr James Brigers to attempt to locate it again for rebuilding. 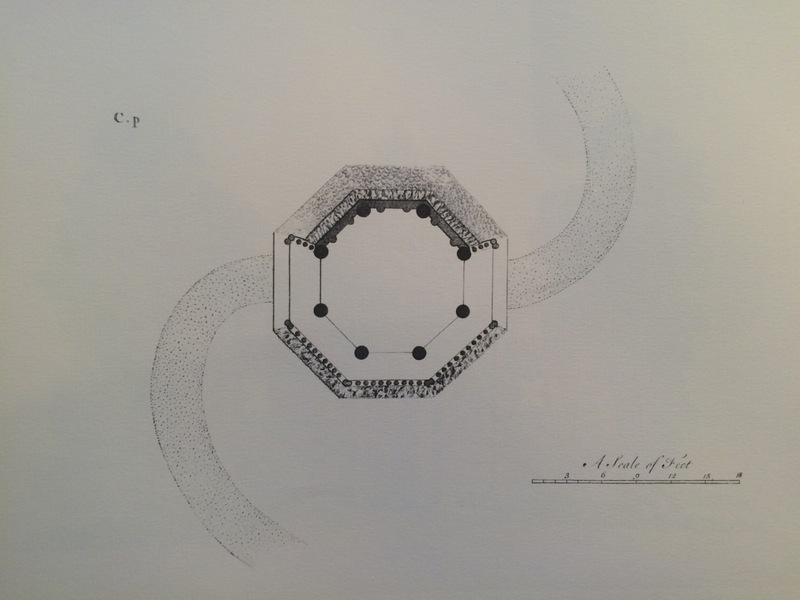 The Druid’s Hut 2015: Archaeology by Mr. James Brigers which has revealed the original postholes which allow for an accurate circumference of the building and therefore the full dimensions for re-construction. 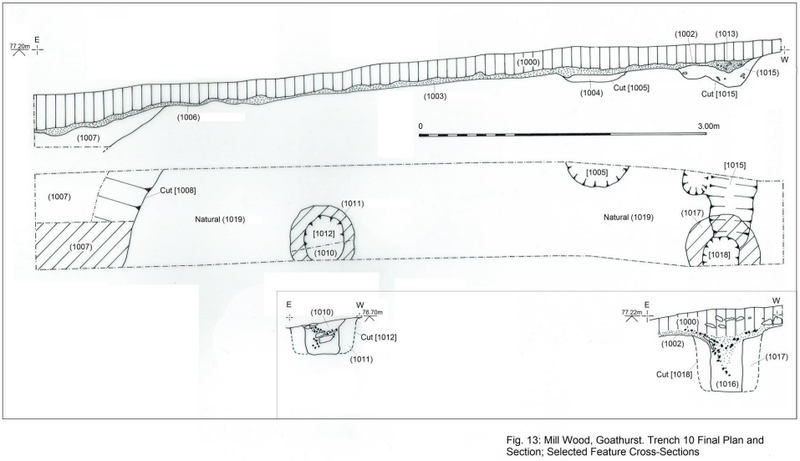 Diagram of the Druid’s Hut trench. 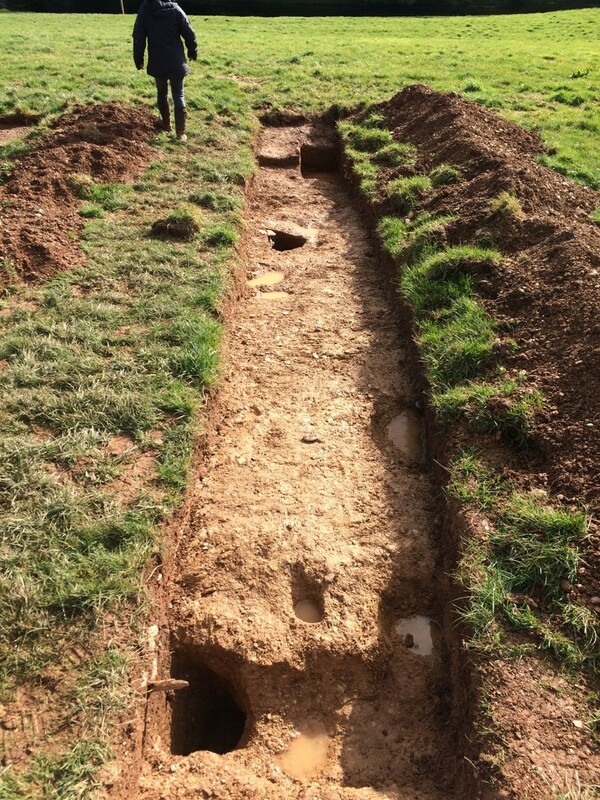 By using the surprisingly accurate eighteenth-century estate maps Mr Brigers was able to locate a site for opening up a trench and on the first attempt was able to find two post holes well beneath the surface, holes that held the original posts. By locating two of these post holes the exact circumference of Wright’s hut is now known. By using this information alongside the photograph with children climbing the building taken in the 1960’s an exact set of specifications can be created for raising plans to re-build the structure. Water worn pebbles were also found which corroborated Mrs. Gill Durman’s evidence of the cobblestone flooring. The tree re-planting that has recently been carried out in Mill Wood has left this space open for the building’s future re-creation, which will be one of the many individual projects that will run concurrently within the landscape.